I can remember the outside of her building, but not the lobby or the hallway. I can remember what it felt like walking into her apartment, but don't actually have pictures of the inside. The only ones that exist are filed away in my mind. I can even remember the smells. Chicken soup on the stove. Probably my dad's, but she prepared it as if it were her own. I remember tootsie rolls. In her purse. Always. I can remember the days she would sit on the couch. At my parents' house. My house. Teaching me the Yiddish words for the parts of my face. Eyes. Mouth ... mouth. Why can't I remember the word for mouth? Her smile. Eyes sparkling. Cheekbones high. I have them, too. My father's. His mother's. I don't see them on my daughter, but my niece carries them well. They live on. Her perfectly kept hair. Her kerchief. Several. I still have some. And then, when she no longer remembered. We moved her to a home. The most difficult experience our family had weathered. She walked at first. We walked the halls with her. Keeping her mobile. Her strength unwavering. She never let go of our hands. We sang. In whispers. So as not to disturb the other residents. When she could no longer walk, we pushed her wheelchair around the nursing home hallways. Still singing. Or my father would push as we held her hands. My brother and I. Or my mother and I. G-d, she held on so tightly. Even when her body refused to allow us to know that she recognized us. Even on those days when her eyes betrayed what we knew was there. Her hands. Her grasp. The grip she held on us proved the rest of her wrong. She knew us. She held onto us with all her might. Those last years. So so many years. She fought and held on. We went every weekend. My father nearly every night. He'd swing home and pick me up to bring me with him. I needed to be there, too. Amazingly enough, in all that she could not remember, she knew the words to the songs of her childhood. Of her life. She knew the Pledge. Yes, seriously. I miss her terribly. And I think about her often. There is so much more to her story that I haven't even touched on here. How she traveled from Israel with her husband and two children - by boat - to the United States. With a stop in Italy (Italy!) for a few months. All after living in Germany and having her son (my father) there. There is so much more to say. So much I don't even know. I just know I miss her. And that my daughter will always know she carries her name - - her middle name is after my grandmother. My Bubby. And I'll forever think of her when I say the words: "I pledge allegiance, to the flag ..." because this was her America. Her words. To become a citizen of one of the greatest countries on earth. And this month I need to remind myself of that. And I think of her. And I remember. That was beautifully written! Thanks for sharing her story... stopping over from Mama Kat's. o.m.g. That was amazing, Andrea, simply amazing. I love that she was such a fighter, and I love the family devotion to her. Awesome post! Andrea, that was beautiful. I want to know more now. I had both of my grandmothers while I was an adult, but there are so many questions I thought of too late. What wonderful memories you have of this special lady. You just made her live on. What a beautiful story! Very well written, you can feel the love you have for her. This brought tears to my eyes! It's crystal clear that you loved your grandmother so very much. It's in all the word you've written. I could feel it. Sensed it. It gave me goosebumps! Your grandmother was one heck of a survivor! A fighter! One tough cookie :) All those journeys she went through before finally settling down in America... it's eye-opening and a reminder of things we took for granted. What a family history! She sounds a.maz.ing! 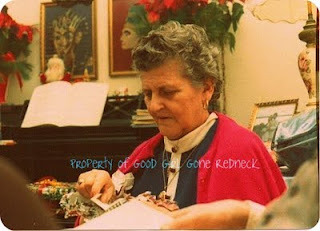 My grandmother had Alzheimers too and I recall the walking and walking. And the many, many years of it. So sad. It's amazing what the memory clings to even in the throes of illness. May your Bubby's memory always bring a smile to your face.